Help students develop their vocabulary by organizing words into families. Products include word of the week displays, word walls for various grades, and mini-books. Grades K & up. 90 single-letter cubes (blue consonants and red vowels), with quantities based upon frequency of use. Lowercase on one side, uppercase on the other. Includes plastic storage jar and guide. Grades K - 3. 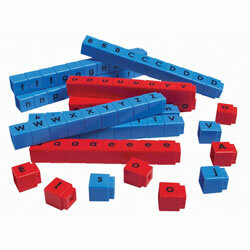 Designed to be used with the Unifix® CVC Letter Cubes. Students build vocabulary and spelling skills as they build words based upon common word-family endings with these colorful task cards. Set of 24 cards. 4 years & up. Build vocabulary, improve rhyming skills, and practice identifying initial and final consonant sounds. 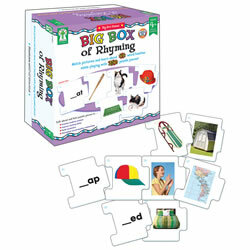 The Big Box of Rhyming uses puzzle pieces with pictures of 45 word families to help children visually connect vowel sounds and more to daily life. Rhyming words are like building blocks of language. 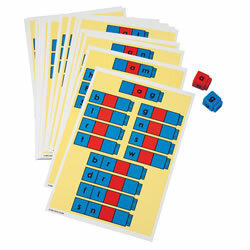 They introduce and expand word recognition, word vocabularies and phonemic awareness. Great for children that struggle with speech and more. Includes 250 puzzle pieces measuring 2"x 2" each.